GILLIARD NOTE: Queen Victoria did not like the Germans and had a particular aversion to the Emperor William II, which she handed on to her granddaughter, who always preferred England, her country on her mother's side, to Germany. Yet she always remained greatly attached to the friends and relations she had left there. At the age of seventeen the young princess paid a prolonged visit to Russia, staying with her elder sister Elisabeth, who had married the Grand-Duke Sergei Alexandrovich, a brother of the Tsar Alexander III. She took an active part in Court life, appeared at reviews, receptions, and balls, and being very pretty was made a great fuss of. Left; Alexandra, in the tiara of Empress Elizabeth, wife of Alexander I. Everybody regarded her as the prospective mate of the Heir the Throne, but, contrary to general expectation, Alice of Hesse returned to Darmstadt and nothing had been said. Did she not like the idea ? It is certainly a fact that five years latter, When the official proposal arrived, she showed signs of hesitation. However, the betrothal took place at Darmstadt during the summer of 1894, and was followed by a visit to the Court of England. The Russian Heir at once returned to his country. 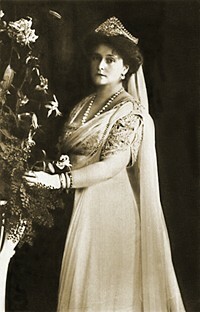 A few months later she was obliged to leave suddenly for Livadia, where Alexander III was dying. She was present when his end came, and with the Imperial family accompanied the coffin in which the mortal remains of the dead Emperor were carried to St. Petersburg. The body was taken from Nicholas station to the Cathedral of St. Peter and St. Paul on a dull November day. A huge crowd was assembled on the route of the funeral cortege as it moved through the melting snow and mud with which the streets were covered. In the crowd women crossed themselves piously and could be heard murmuring, in allusion to the young Tsarina, "She has come to us behind a coffin. She brings misfortune with her." It certainly seemed as if from the start sorrow was dodging the steps of her whose light heart and beauty had earned her the nickname of "Sunshine" in her girlhood. On November 26th, thus within a month of Alexander's death; the marriage was celebrated amidst the general mouning. A year later the Tsarina gave birth to her first child - a daughter who was named Olga. The coronation of the young sovereigns took place in Moscow on May 14th, 1896. Fate seemed already to have marked them down. It will be remembered that the celebrations were the occasion of a terrible accident which cost the lives of a large number of people. The peasants, who had come from all parts, had assembled in masses during the night at Hodinskoie meadows, where gifts were to be distributed. As a result of bad organization there was a panic and more than two thousand people were trodden to death or suffocated in the mud by the terror-stricken crowd. When the Tsar and Tsarina went to Hodinskoie meadows next morning they had heard nothing whatever of the terrible catastrophe. They were not told the truth until they returned to the city subsequently, and they never knew the whole truth. Did not those concerned realise that by acting thus they were depriving the Imperial couple of a chance to show their grief and sympathy and making their behavior odious because it seemed sheer indifference to public misfortune? Several years of domestic bliss followed, and Fate seemed to have loosened its grip. Yet the task of the young Tsarina was no easy one. She had to learn all that it meant to be an empress, and that at the most etiquette-ridden Court in Europe and the scene of the worst forms of intrigue and coterie. Accustomed to the simple life of Darmstadt, and having experienced at the strict and formal English Court only such restraint as affected a young and popular princess who was there merely on a visit, she must have felt at sea with her new obligations and dazzled by an existence of which all the proportions had suddenly changed. Her sense of duty and her burning desire to devote herself to the welfare of the millions whose Tsarina she had become fired her ambitions, but at the same time checked her natural impulses. Yet her only thought was to win the hearts of her subjects. Unfortunately she did not know how to show it, and the innate timidity from which she suffered was wont to play the traitor to her kind intentions. She very soon realised how impotent she was to gain sympathy and understanding. Her frank and spontaneous nature was speedily repelled by the icy conventions of her environment. Her impulses came up against the prevalent inertia about her, and when in return for her confidence she asked for intelligent devotion and real good will, those with whom she dealt took refuge in the easy zeal of the polite formalities of Courts. GILLIARD NOTE: She was extremely anxious to improve the lot of poor women by building maternity and other hospitals. She hoped to establish professional schools and so on. In spite of all her efforts, she never succeeded in being merely amiable and acquiring the art which consists of flitting gracefully but superficially over all manner of subjects. The fact is that the Tsarina was nothing if not sincere. Every word from her lips was the true expression of her real feelings, Finding herself misunderstood, she quickly drew back into her shell. Her natural pride was wounded. She appeared less and less at the ceremonies and receptions she regarded as an intolerable nuisance. She adopted a habit of distant reserve which was taken for haughtiness and contempt. But those who came in contact with her in moments of distress knew what a sensitive spirit, what a longing for affection, was concealed behind that apparent coldness. She had accepted her new religion with entire sincerity, and found it a great source of comfort in hours of trouble and anguish; but above all, it was the affection of her family which nourished her love, and she was never really happy except when she was with them. 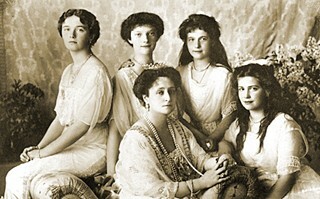 Above; from left - Olga, Tatiana, Alexandra, Anastasia and Marie. The birth of Olga Nicolaievna had been followed by that of three other fine and healthy daughters who were their parents' delight. It was not an unmixed delight, however, for the secret desire of their hearts - to have a son and heir - had not yet been fulfilled. The birth of Anastasia Nicolaievna, the last of the Grand-Duchesses, had at first been a terrible disappointment . . . and the years were slipping by. At last, on August 12th, 1904, when the Russo-Japanese War was at its height, the Tsarina gave birth to the son they so ardently desired. Their joy knew no bounds. It seemed as if all the sorrows of the past were forgotten and that an era of happiness was about to open for them. Alas! it was but a short respite, and was followed by worse misfortunes: first the January massacre in front of the Winter Palace - the memory of which was to haunt them like a horrible nightmare for the rest of their days-and then the lamentable conclusion of the Russo-Japanese War. In those dark days their only consolation was their beloved son, and it had not taken long, alas! to discover that the Tsarevitch had haemophilia. From that moment the mother's life was simply one dreadful agony. She had already made the acquaintance of that terrible disease; she knew that an uncle, one of her brothers, and two of her nephews had died of it. From her childhood she had heard it spoken of as a dreadful and mysterious thing against which men were powerless. And now her only son, the child she loved more than anything else on earth, was affected! Death would watch him, follow him at every step and carry him off one day like so many boys in his family. She must fight! She must save him at any cost! It was impossible for science to be impotent. The means of saving must exist, and they must be found. Doctors, surgeons, specialists were consulted. But every kind of treatment was Wed in vain. When the mother realised that no human aid could save, her last hope was in God. He alone could perform the miracle. but she Must be worthy of His intervention. She was naturally of a pious nature, and she devoted herself wholly to the Orthodox religion with the ardour and determination she brought to everything. Life at Court became strict, if not austere. Festivities were eschewed, and the number of occasions on which the sovereigns had to appear in public was reduced to a minimum. The family gradually became isolated from the Court and lived to itself, so to speak. Between each of the attacks, however, the boy came back to life, recovered his health, forgot his sufferings, and resumed his fun and his games. At these times it was impossible to credit that he was the victim of an implacable disease which might carry him off at any moment. Every time the Tsarina saw him with red cheeks, or heard his merry laugh, or watched his frolics, her heart would fill with an immense hope, and she would say: "God has heard me. He has pitied my sorrow at last." Then the disease would suddenly swoop down on the boy, stretch him once more on his bed of pain and take him to the gates of death. The months passed, the expected miracle did not happen, and the cruel, ruthless attacks followed hard on each other's heels. The most fervent prayers had not brought the divine revelation so passionately implored. The last hope had failed. A sense of endless despair filled the Tsarina's soul; it seemed as if the whole world were deserting her (Her continual fear of an attempt on the life of the Tsar or her son always helped to wear down the Tsarina's nervous vitality). It was then that Rasputin, a simple Siberian peasant, was brought to her, and he said: "Believe in the power of MY prayers; believe in my help and your son will live! " The mother clung to the hope he gave her as a drowning man seizes an outstretched hand. She believed in him with all the strength that was in her. As a matter of fact, she had been convinced for a long time that the saviour of Russia and the dynasty would come from the people, and she thought that this humble moujik had been sent by God to save him who was the hope of the nation. The intensity of her faith did the rest, and by a simple process of auto-suggestion, which was helped by, certain perfectly casual coincidences, she persuaded herself that her son's life was in this man's hands. Rasputin had realised the state of mind of the despairing mother who was broken down by the strain of her struggle and seemed to have touched the limit of human suffering. He knew how to extract the fullest advantage from it, and with a diabolical cunning he succeeded in associating his own life, so to speak, with that of the child. 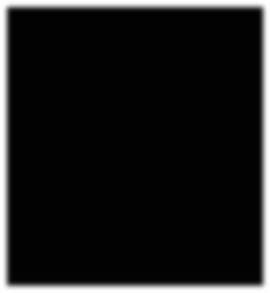 This moral hold of Rasputin on the Tsarina cannot possibly be understood unless one is familiar with the part played in the religious life of the Orthodox world by those men who are neither priests nor monks-though people habitually, and quite inaccurately, speak of the "monk" Rasputin - and are called stranniki or startsi. The strannik is a pilgrim who wanders from monastery to monastery and church to church, seeking the truth and living On the charity of the faithful. He may thus travel right across the Russian Empire, led by his fancy or attracted by the reputation for holiness enjoyed by particular places or persons. The staretz is an ascetic who usually lives in a monastery, though sometimes in solitude - a kind of guide of souls to whom one has recourse in moments of trouble or suffering. Quite frequently a staretz is an ex-strannik who has given up his old wandering life and taken up an abode in which to end his days in prayer and meditation. "The staretz is he who takes your soul and will and makes them his. When you select your staretz you surrender your will, you give it him in utter submission, in full renunciation. He who takes this burden upon him, who accepts this terrible school of life, does so of his own free will in the hope that after a long trial he will be able to conquer himself and become his own master sufficiently to attain complete freedom by a life of obedience-that is to say, get rid of self and avoid the fate of those who have lived their lives without succeeding in sufficing unto themselves." God gives the staretz the indications which are requisite for one's welfare and communicates the means by which one must be brought back to safety. On earth the staretz is the guardian of truth and the ideal. He is also the repository of the sacred tradition which must be transmitted from staretz to staretz until the reign of justice and light shall come. Several of these startsi have risen to remarkable heights of modern grandeur and become saints of the Orthodox Church. The influence of these men, who live as a kind of unofficial clergy, is still very considerable in Russia. In the provinces and open country it is even greater than that of the priests and monks. 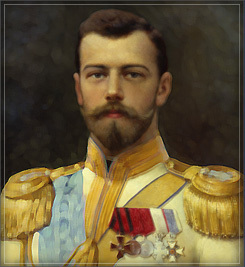 The conversion of the Tsarina had been a genuine act of faith. The Orthodox religion had fully responded to her mystical aspirations, and her imagination must have been captured by its archaic and naive ritual. She had accepted it with all the ardour of the neophyte. In her eyes Rasputin had all the prestige and sanctity of a staretz. Fate willed that he who wore the halo of a saint should be nothing but a low and perverse creature, and that, as we shall soon see, this man's evil influence was one of the principal causes of which the effect was the death of those who thought they could regard him as their saviour.